Discover the answer to the most important question in leadership. If you've ever asked yourself why you do what you do, or wondered what your purpose in leadership or life really is, this book is for you. As the lives of a coach, a CEO, and a janitor intersect in this modern-day parable, you will be led on a journey deep into the heart of leadership, where the answers to some of the most important questions in life can be found. Whether you're leading in business, sports, or simply in your own family, this inspiring story will guide you toward the first--and most important--step in becoming the leader you were meant to be. LEAD...for God's Sake! truly is much more than a simple statement. It's a call! "I want to personally thank you for writing this book. It was as if you wrote this book about me! As the Founder and CEO of an international company with the responsibility of leading over 5,000 people I have met and studied many of the great writers on the subject of leadership. I am a committed brother in Christ but found myself over the last 6 months asking so many of the questions asked in your book. Your book completely changed my outlook on why I do what I do and yesterday at our annual Partner/Executive review and planning meeting I shared with all my leaders how your book will serve as the foundation of how we lead in our company." "[Lead…for God’s Sake!] was the best book that I have ever read. It is right on as to the secrets of leading others in all walks of life. I am a Hall of Fame Coach in Indiana and I am the owner and Director of football camps in the summer. Your book is a masterpiece." "I have read over 100 leadership books, biographies of leaders and how-to leadership books. Reading Lead... for God's Sake! was a joy, in that it cut to the core of all we do, the why. When most feel that the why is just a because, this book had got me thinking and re-evaluating what I do in my life and why. Thank you for this wonderful book!" "Great book! I loved how you took on the prevailing "bent" towards fulfilling our passion and did it in a winsome way. You are right: we are called to thrive where we are planted and to live passionately." "IF EVER THERE WAS A BOOK THAT COULD BE A DESK REFERENCE FOR HOW TO BE A REAL LEADER, THIS IS IT!!!!! Lead for God's Sake is simply required reading for all men, woman, and young adults who aspire to find purpose and life and more importantly, who seek to make a difference in this world. In a world that is so full of darkness, this book is a POWERFUL light." "I cant believe what I just read. I am a Football Coach in South Carolina. I am 34 years old. This book was sitting on my desk for three months before I decided to read it. Im not sure if I will coach forever but I know I will always be around young people and the game itself as either a coach or athletic director. The inspiration to write this book is life changing. All I can say is Thanks for the eye opener!" "I just completed your book and must say it was extremely motivational and spoke to my heart about one on one discipleship with other men. I have been in the ministry for 40 years come next March and I can honestly say this was one of the most exciting and helpful books I have ever invested my time with. I found it hard to put down once I started it"
From the first page, I was captivated by the characters created by author Todd G. Gongwer. This book is a challenging parable of what it means to lead, to fail and to succeed. The setting for this parable is a High School basketball coach who is struggling to lead in the midst of personal turmoil, but the application of these lessons will go straight to the heart of every leader. " "I was in a bookstore yesterday and after perusing a few books in the inspirational section, I found myself drawn to the single copy of your book. It just seemed to jump off the shelf letting me know I HAD to get it. I have, in a single day, finished reading your book. Yes, I'm another one of those people that could not put your book down. Well, believe me, I NEVER thought I'd, one, finish it so quickly but two, be so impacted by its message. I was mesmorized by every word. Its message was received loud and clear. The message was very timely. I find myself very humbled by its message. Apparently, I am being called to delve deeper in my relationship with Jesus all while loving those in my life. Thank you for the gift of reminding me why I am really here." "As a leader in corporate America I have read several books on leadership and styles. While they all have take always I will say "Lead for God's Sake" has had the biggest impact. It started with just reading the book, which I could not put down. I found my self reading on my iPad while standing in line at the airport or wherever to just finish it. I was moved and emotionally tied to the story of the book. At times bringing tears to my eyes and just feeling the presents of Christ in the moment. So nice to see how you can tie leadership skills with solid biblical learnings and see results. I have already gifted the book to others and recommend to anyone else I have a chance to talk to about it. Everyone has a leadership role from leading teams, groups or families. And everyone can benefit from reading "Lead for God's Sake"." "I was so engage by this book that at the end of it, the honest feeling was to start reading it AGAIN. I can not say enough about what a MASTER piece this story really is. By the way let me establish the fact that I'm not a READER, and once I started Lead for GOD'S Sake! I couldn't put it down. This book makes for a GREAT gift this holidays, to anyone you care about!!!!" When I first picked this book up I had no idea the impact it would have on me and the people around me! Some books have great stories or parables but this is a parable that can effect anyone no matter who they are or what they do for a living. We often get lost in life searching for the THINGS in life rather than the people in our life. If you want a true eye opening experience to the way people should view the world and why we are who we are then buy this book. The 11 dollars are nothing compared to the reward of father and love that this book will give you. Thanks Todd! I am an NCAA College Athlete, am a fraternity brother in SAE, and am NOT an avid reader. When my parents gave me Lead... For God's Sake as a Christmas present, I thanked them and thought to myself, "Awesome, just another book to collect the dust in my room." Little did I know I would be writing a review for it, and recommending it to other athletes, teammates, friends, and family. This book has a message and many life lessons that anyone can learn from. This book has a story that anyone can relate to or connect with in someway, whether you are an athlete, a businessman, a parent, or just someone who wants to read what people including myself are talking about. Lead... For God's Sake was a gift to me, one of the few that truly will never stop giving. I grew up in a family of 5, where I was forced to go to church every Sunday, where I wasn't allowed to eat a meal without a prayer being said, and where I was restricted on which parties or friends houses I could or could not go to based on what my parents had heard about that place or family. This was at times frustrating and very tough for me, coming to school on Monday, or going to practice on the weekends and hearing about what I had missed out on the night before. During the summer, I even would get to the course after church, and the guys who played in the morning game would have already teed off, therefore I didn't have a game to play in that day. When I finally made my college decision, I couldn't wait to be on my own and make my own decisions. I was excited to be apart of a college sports team, be able to hangout with whoever I wanted to, whenever I wanted to, and participate in the college social scene with no one telling me what I could and could not do. I have been reluctant to read this book for many months, not fully understanding what it was. The author is from the small town we live in, and actually attends the same church as my family (their children are in my children's classes at school as well). While there has been much hype in our area since the release of the book, it was never one I intended to purchase, I thought it was a "self-help" book of sorts. Then it became available through one of the company's I do book reviews for, so I thought I would give it a try. While the beginning was a bit rough for me (some choice language is sprinkled through out the first few chapters), I thoroughly enjoyed this book! Needless to say, I immediately handed it off to my husband, who is an elementary school teacher and basketball coach, and told him it is a "must read"! While the book does deal with leadership and "self help" issues, it felt more like a fiction story I was reading, which is right up my alley! Coach Rocker is dealing with many issues that are relevant in marriages today, and seems to be going through much more in his job as well. He struggles in many areas, and at times is just trying to stay afloat. How can he be the leader others expect him to be, when he doesn't even have his own life in order? Lead… for God’s Sake! is a book like no other. It’s definitely the best book I read all year. 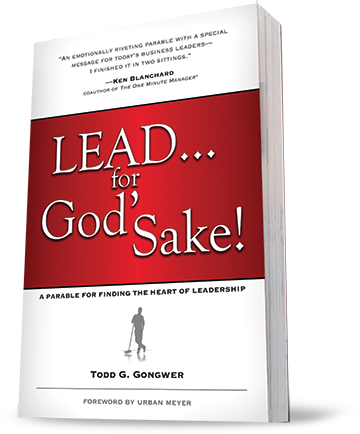 Todd Gongwer writes with honesty and depth about a very important theme: How to lead with the heart so that the leader could show the team how to be the best each person can be through his example and behavior. The book is a story about a high school basketball coach, Steve Rocker. Steve was very successful in previous years. Strangely, this year was very different for him. His team lost a lot of games, but most importantly the boys had no motivation and inclination to bring the team out of the rut that they found themselves in. Steve tried all the motivational methods at his disposal that worked in the past. But for some reason beyond everyone’s comprehension, including his own, nothing was working. Lead for God’s Sake is a great little book that was given to me by Keith Tyler. Keith is the head of the West Virginia Fellowship of Christian Athletes. Keith was also an outstanding athlete. He ended his basketball playing days at The University of Charleston as their second all time leading scorer. In my six years as the head football coach at the University of Charleston, Keith was an invaluable resource to me. He helped counsel players who were struggling and led our pre-game devotional service. He attended our practices at least once a week and really developed strong relationships with both the players and the coaches. So when Keith Tyler recommends a book; I read it. Todd G. Gongwer has written an inspirational parable that you will not be able to put down. A parable is an interesting genre for getting your point across. Patrick Lencioni wrote a popular business parable that I also reviewed The Five Dysfunctions of a Team (I would also re-recommend that book). Gongwer has hit a home run with his book as well. Todd Gongwer’s first book is a “three point play” that will warm the heart of anyone who has ever coached or played high school basketball. Its light hearted and yet deeply penetrating story line is engaging, inspirational and at times poignant. Gongwer’s “parable” interweaves the lives of three adults (the local high school coach, the school’s custodian and a prominent local businessman) with the experiences of a highly ranked but underachieving high school basketball team. “Coach” has to sort through the advice he receives from a trusted friend and mentor who just happens to be a highly successful businessman along with the encouraging but somewhat confusing and befuddling comments from the school’s sage custodian. All the while the pressure is building upon him and his floundering team. Preseason “number one” hype is quickly fading as his team is beleaguered with selfish attitudes, personal issues and injuries. Add in the tension of the coach’s disintegrating marriage and family and the recipe for disaster is apparent. The first thing that attracted me to this book was the sports theme. But as you get deeper into it, the message goes far beyond sports. Leadership isn't confined to certain people in certain positions, but rather, extends to everyone. Whether that's in your personal life, in your business, or within a church, we are all called to leadership in one form or another. Sports coaches across the country have been reading this book and have begun recommending it to their players and coaching staff. It is a very well written book that will capture your attention and prompt you to evaluate your influence on others. Be prepared for a cliff-hanger ending!